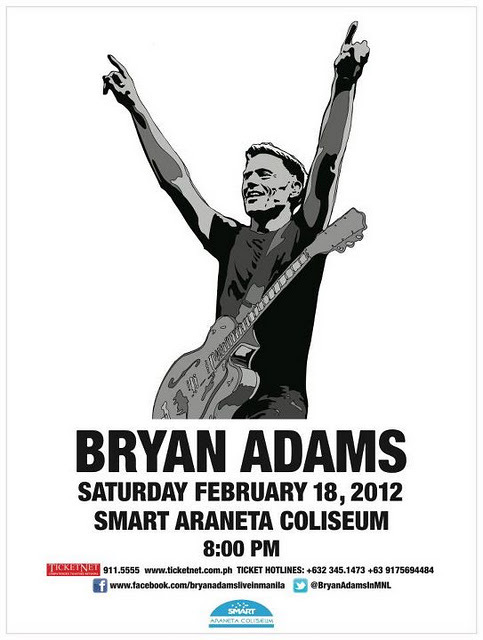 Bryan Adams Manila Concert Live on February 18, 2012 at SMART Araneta Coliseum. Bryan Adams is famous for Classic Rock songs "Please Forgive Me" and "Heaven". Bryan Adams Manila Live Concert is presented by Dayly Entertainment and ARF Entertainment. Bryan Adams Manila Concert Live Ticket Prices: PATRON VIP 101 & 103 Ticket Price Php 7,950 ; PATRON Ticket Price Php 6,360 ; LOWER BOX CENTER (LB 200 AND 201) Ticket Price Php 6,360 ; LOWER BOX SIDES (Reserved Seating) Ticket Price Php 5,300 ; UPPER BOX A (Reserved Seating) Ticket Price Php 2,915 ; UPPER BOX B Ticket Price Php 2,120 GENERAL ADMISSION Ticket Price Php 795. Bryan Adams Manila Live Concert 2012 Ticket Outlets at all Ticketnet outlets. Call 911-5555 or visit www.ticketnet.com.ph for more details about the show. 0 comments: on "Bryan Adams Manila Concert Tickets Prices and Outlets February 18 2012"